LTC John E. Robertson, Jr. D7873 (Life), age 75, died of cancer on 27 March 2019. “Jack” died at the home he shared with his daughter Cheryl and her family. He was the husband of the late Carol J. Robertson. Jack’s military career started with his enlistment in Battery B, 2nd Missile Bn, 243d Artillery, RI Army National Guard on 6May64. He served as a missile crewman until he attended Officer Candidate School. He graduated OCS in 1967 and was commissioned as an Infantry Second Lieutenant. He was assigned to Company D, 19th Special Forces Group (Airborne) RIARNG. He served as an SFODA commander and S-2 with Company C, 5th Bn, 20th SF Gp (A) RIARNG. While serving as S-2 he changed branches from Infantry to Military Intelligence. Jack competed the SF Jumpmaster Course and the SFQC. In 1975, he transferred to the Rhode Island Military Academy and served as the S-3. In 1980, he was assigned to HHD, RIARNG (Selective Service Section). On 1Mar87, he transferred to the USAR Control Group and was promoted to Lieutenant Colonel. His awards included the Senior Parachutist Badge and the SF Tab. 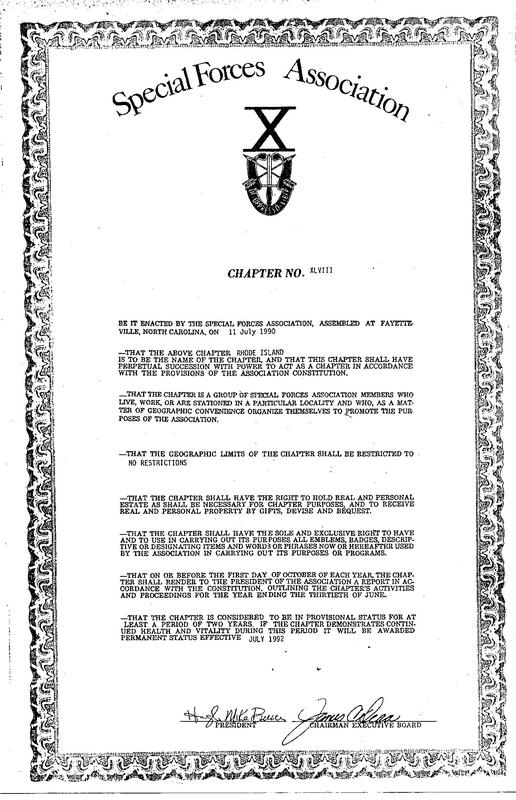 Jack served as President, Chapter XLVIII, SFA from 2008 until 2010. He was employed by Verizon for 37 years prior to his retirement. 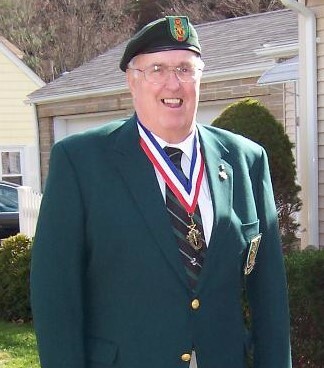 Jack was buried with military honors in St. Joseph Cemetery, West Greenwich, RI on 1 April 2019. Members of Chapter XLVIII provided an honor guard at his wake, at the church and at the cemetery. 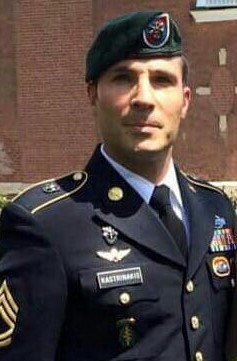 Sergeant First Class Paul John Kastrinakis, 46, passed away on February 7, 2019 at Inova Fairfax Hospital in Annadale, VA from a severe bacterial infection. He graduated Westfield State University with a Bachelors in Criminal Justice and Anna Maria College with a Masters in Criminal Justice. Paul was a retired Massachusetts State Police Trooper where he served on the State Police Bomb Squad. The events of 9/11 compelled Paul to enlist in C Co 1st BN 104th INF, MAARNG on 23Oct01. On 22Apr03, he transferred to Company A, 2nd Bn, 19th SF Gp (A), RIARNG and started his Special Forces service. He successfully completed the Basic Airborne Course, SFQC and 18C training. In 2011 he transferred to Company C, 1st Bn, 20th SF Gp(A), MAARNG and served until 2013. He deployed to Iraq and Afghanistan during his Special Forces service. His numerous awards and decorations included the Parachutist Badge, the Special Forces Tab and the Combat Infantryman Badge. Paul most recently supported the Department of Homeland Security as a cybersecurity exercise planner. He leaves behind his wife, Catherine Kastrinakis, of Pittsfield; his beloved children, Luc and Malcolm; his mother and father, Joyce and John Kastrinakis of Lenox; his brothers and their wives, Jason and Sabrina Kastrinakis of Pittsfield, Alex and Lynsey Kastrinakis of Hancock, and George and Sheila Kastrinakis of Lee; as well as many nieces and nephews. Greek Orthodox funeral services for Paul was held on February 18, 2019 at St. Ann’s Church in Lenox.